The development of forest policies is evolving rapidly to keep up with new developments in the forest sector of countries around the world. Such developments include increased decentralization, economic and livelihood demands for forest products and services, recognition of the importance of biodiversity, and of the relationships between forests and climate change. In these new contexts, public forestry agencies need to ensure that a wide range of interests are considered while producing a consistent and clear policy that strategically guides the forest sector. Since forest policy is increasingly shaped by complex interactions of different state and private stakeholders, often with competing interests, steering and facilitating a process to develop a formal forest policy or strategy is a significant challenge. Societal changes require public forest agencies to adapt their roles, structures and functions to new demands. Better dialogue with new “actors” such as small and medium forest enterprises and communities is needed. Greater institutional coordination is also needed. While policy reviews, institutional development, and improved public-private dialogues have, in the past, been dealt with largely in isolation of one another, a wider exploration and use of their linkages is necessary. To support forestry institutions learning from each other about challenges and experiences in linking policy to institutional development, FAO organized a regional meeting “Forest policy and institutions development in Central Asia” aimed at gathering senior decision makers of public forestry agencies and key stakeholders in the forest sector to share their experiences and knowledge. 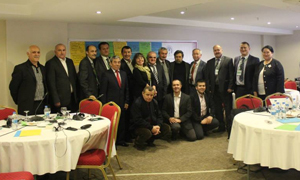 The workshop was held on February 4-7, 2014, in Trabzon, Turkey and was attended by 23 participants which included academics, forestry experts, private sector representatives, NGOs as well as top executives from public forestry administration from the countries of the Sub-Region (SEC), namely, Azerbaijan, Kazakhstan, Kyrgyzstan, Tajikistan, and Turkey. Turkmenistan and Uzbekistan did not nominate participants to the workshop. The workshop was organized and led by FAO specialists from Headquarters (FOE) and from the Sub-regional Office for Central Asia together with Chamber of Forest Engineers (OMO).